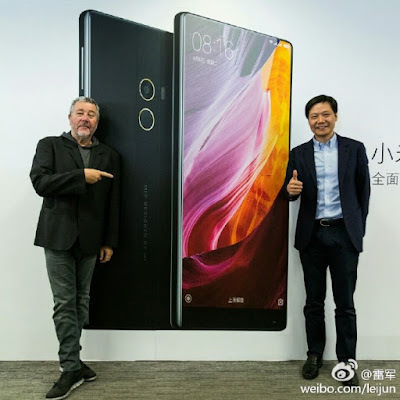 The new smartphone will be designed by Frenchman, Philippe Starck, who designed the Mi Mix. It is expected that this smartphone will be covered entirely with the display on the front without a physical button. Xiaomi Mi MIX has a 6.4-inch screen with 91.3% screen-to-body ratio powered by a Snapdragon 821 Processor coupled with 4GB/6GB of RAM and 128GB/256GB of internal storage. On Camera, it has a 16MP rear camera and 5MP front-facing camera Packed by a 4400mAh Battery. The device runs on Android 6.0 with MIUI 8 on top of it. Instead of a standard proximity sensor, Mi MIX uses ultrasonic technology and uses Cantilever piezoelectric ceramic acoustic system instead of a standard earpiece, allowing you to listen to calls without the earpiece. It also has a fingerprint sensor on the back.